New Denver, population, about 600. Yes, named after the “old” Denver, with which New Denver shared many characteristics. 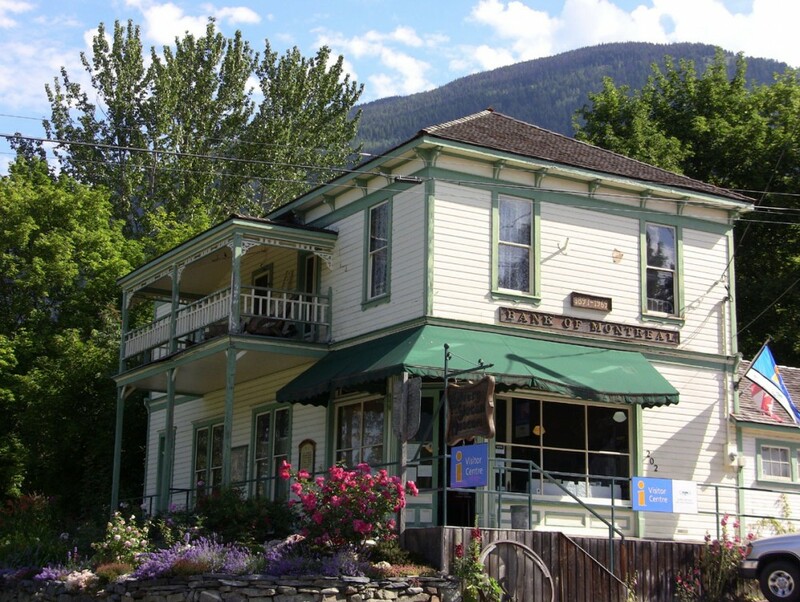 Nestled on the shore of Slocan Lake, and the shore of Slocan Lake, surrounded by the 2,100 m (almost 7,000 ft) Valhalla peaks in the Selkirk Mountains, New Denver is a stunningly beautiful town with roots in the silver rush of the late 1800s. New DenverBefore First Nations people used the beaches and fished the rich waters of Slocan Lake for salmon and trout. They left behind rock carvings and paintings (petroglyphs) which can still be seen on the rock cliffs that are accessible only by water. No one knows for sure how old they are. Founded in 1892 by silver miners, New Denver reached its economic peak in the early 20th century. But by 1920, the mining boom was over. After the mining bust, logging was the main industry, but now tourism and other business has diversified the economy. New Denver is a progressive village that values its history and future. During World War II after the bombing of Pearl Harbor, the Canadian government sent thousdands of Japanese-Canadians to internment camps in the BC Interior. New Denver had a number of abandoned houses from the boom times, and many more smaller dwellings were built to house 2,000 men, women and children of Japanese origins. Some of these tiny houses still exist. The spectacular beauty of the surrounding outdoors leaves its mark on everyone who lives and visits New Denver. David Suzuki, world-famous and award-winning scientist, environmentalist and broadcaster, was born in Vancouver and in 1942 at age 6 was interned in New Denver. He spent much of his time in the mountains, exploring nature. While local children now go to school, many today spend their free hours in the incredible outdoors around New Denver. New Denver New Denver is a hub of outdoor opportunities including fishing, hiking , biking, scuba diving, water and winter sports. Make sure you check out the enchanting 13km (8mile) Galena Trail which follows the old Nakusp and Slocan railway bed, Valhalla Park and the Idaho Peak Lookout. .A stroll around the beautiful Kohan Gardens on the waterfront gives you some fresh air, peace of mind, all without breaking a sweat. Indoors, there is the Silvery Slocan Museum, a designated Heritage Site in what once was the old Bank of Montreal building. The Nikkei Internment Memorial Centre tells the story of the interned Japanese-Canadians. Artisans have studios, and local accommodation is available to rest your head. Funky eateries satisfy hunger. Feeling inspired by the scenery? A number of religious organizations will welcome you. Come on, stay a day, a week, or the rest of your life in New Denver!